Cooking With Carlee: Tea Cake Cookies - A Good Family Dinner Needs a Dessert! 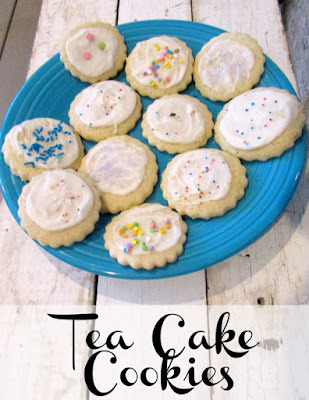 Tea Cake Cookies - A Good Family Dinner Needs a Dessert! It has been fun sharing our Southern Plate inspired meal with you. All of our family dinners end up with some kind of dessert. There were two recipes I wanted to try in the spring chapter of Christy Jordan's cookbook. Mama Reed's tea cakes sounded like something we should definitely try. She describes them as tender little cake that is soft and pillowy with just a touch of sweetness. 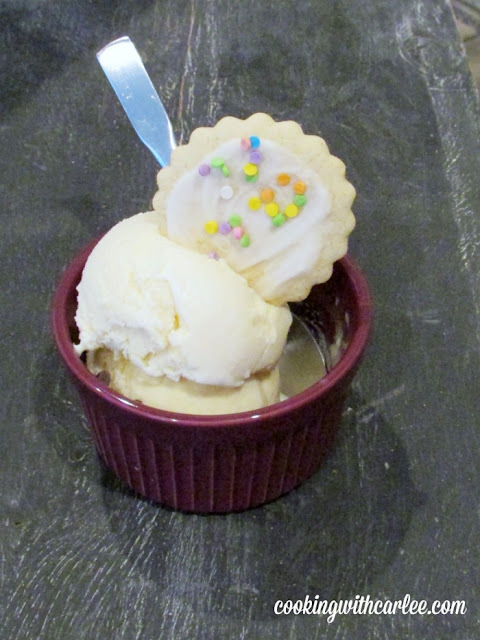 I chose to add the simple icing that is offered as an option and am glad that I did. Without the icing these would not have been sweet enough for our liking. Cream together the butter and sugar. Add the eggs, one at a time and mix until incorporated. Add the flour and vanilla and mix well. Place on a floured board and roll thin. Cut with a simple cookie cutter or biscuit cutter. Place on greased cookie sheet and bake for 10 minutes or until just lightly browned on the edges. Cool for a couple of minutes on the baking sheet and then remove to wire rack to cool completely. Stir the butter into the confectioners sugar. Add the milk and stir until any lumps are gone. Spoon onto cookies or tea cakes and spread with the back of a spoon. Top with sprinkles while still wet if desired and let dry completely before stacking and storing. They would be perfect for a tea party! These cookies sound so good! Thanks for sharing the recipe to make them! Thanks, Julie! I hope your weekend is fabulous as well! These look so sweet and delicate! I'd love one or two! Aren't they cute? And simple too which is part of what I like aobut them!